More and more people are taking SUP boards to lakes, rivers, and bays for fun, fitness, and exploration. We have a natural urge to see what is up the beach or around the corner, and Standing Up gives you a much better view of what is around you, and under the water. It doesn't take long to develop a strong stroke, and before you know it you are pushing yourself a little further each day. Stand up paddle races are becoming very popular. They are easy to organize, and a great way to get some exercise and meet new friends. When designing boards for these conditions, John is free from the requirements of Surf and Cross-over boards; these boards are not meant to surf a breaking wave. The outline, rocker, and rail shape is optimized for speed, tracking, and maximum glide from each paddle stroke. Longer boards are faster, so these boards are 12'6” long, which is the most popular racing class. The nose is narrow, with a pronounced V-shape, which cuts through chop for a smooth fast ride. The rails are vertical and blocky from the mid section all the way to the tail, for clean water-release. The flat bottom and wide tail are more stable than round bottoms and pin-tails, so this is a touring and racing board that anyone can ride. And the AST construction makes a stiff durable board that is still affordable. This is the same shape as the 12'6” TR, but in our exclusive CWS technology. A full carbon/Kevlar bottom and wood sandwich deck saves 4 pounds. 8 mm Sealed Insert: 11'3”, 11'6”, and 12'6” AST models have an 8 mm threaded deck insert in front of the handle. 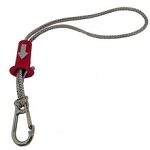 This is for attaching accessories, such as a windsurfing rig, or our water-bottle holder. This insert is sealed, there is no need to plug it as water cannot get into the board. Two-part epoxy paint: New for 2011, the rails of all boards use a special two-part epoxy paint that is super durable, to minimize paddle marks and dings. Molded epoxy fins: Versatile shapes that track and maneuver well. Fit standard longboard style finboxes, with fin-tab and screw. Molded carry handle: Centered on the paddle board for the best balance. Leash insert: Leashes are recommended for surf or high wind. Factory-installed deckpad: Alligator skin pattern is soft on your feet, with high traction surface that will not slip. Air Vent: This vent is open to the core of the board. It must be closed when the board is in the water, so that no water gets into the core. It should be opened if the board will be subjected to high temperatures, or during any transport at high elevations, as this could cause delamination. But don't forget to close it again before use! In most climates, this vent can be left closed all the time. Optional Board Bags are available: Padded Paddle Board Bags shaped to fit Amundson Paddle Boards. Sidewall cinch straps, carry handles, fin slots, with one side in reflective material to minimize heat.